A whole lotta Phatty for a whole lot less money and footprint. Slim Phatty is a winner. The Little Phatty engine at reduced cost. Very portable. USB MIDI compatibility. You lose the keyboard and mod/pitch wheels of the Little Phatty. Control panel is, understandably, more cluttered than that of its bigger brother. Thanks to the edit screen configuring the arpeggiator is easier than ever. The new firmware update means that MIDI CC response is more tightly intergrated than any other Moog synth. Continuously variable wave shapes allow for some unique sound design possibilities. When Bob Moog died in 2005 he left behind a legacy of a life dedicated to the study of Electronic music and instrument design. His success is clear to see, not just in terms of the sales of Moog products themselves but also in the clear awe and wonder the names of his more famous creations continue to inspire. Perhaps most famous of all is the Minimoog but it's fair to say that in the years before his death, Moog's stock was on a high with 2002's Minimoog Voyager a hugely popular synth for those with deep enough pockets. "Overload super-charges the filter's response and is capable of doing the most damage to your speakers." The very last instrument Bob worked on before his untimely death was the portable Little Phatty which features a three-octave keyboard, a classic Moog analogue signal path and a healthy smattering of 21st Century refinements, including USB compatibility and MIDI control messages transmitted from its front-panel dials. The Little Phatty is a glorious instrument and one that we were lucky enough to review upon its release. We fell in love with it to such an extent that our reviewer went out and bought one. So we were both interested and intrigued to see whether the recent announcement of a yet more compact, desktop module synthesizer based on the same sound engine could provide as much bang for its correspondingly reduced buck. Enter the Slim Phatty. The Slim Phatty is a wedge-shaped, chunky desktop module which will either sit proudly upon your desktop or which can be adorned with 19-inch rack ears or even wooden end-cheeks if you're feeling posh (both available optionally and at extra cost). The rear-panel houses the connection ports for headphones as well as audio in and out, volume, pitch and filter CV inputs, a Gate input, MIDI In, Out and Thru ports and the all-important USB connector. The Slim Phatty continues the Moog tradition (since the original Minimoog) of offering its control set at a steep, near 45-degree angled front-panel. The control panel is a perfect replica of that featured on the Little Phatty, albeit with both buttons and dials smaller than those on the keyboard-based big brother and with slightly adjusted colour coding on the buttons. First up you'll find the master section directly below the screen, while the main synth section spreads logically out to the right hand side. The first module deals with the oscillators with a shared waveform dial accessible by each of the two oscillators in turn. Four waveforms are available to either oscillator with shapes of triangle, saw, square and narrow pulse but what's unique about the oscillator stage is that these shapes are continuously variable so that rather than selecting one waveform or another via a knob 'clunk', you can select intermediate waveforms between the shapes, which opens up unique sonic possibilities. Once you've selected waveforms for each of the two oscillators, you can choose their octaves, independently fine tune them, sync oscillator 1's output to that of oscillator 2 and, of course, tweak the Glide control if you want to create portamento effects, which work particularly well on searing leads or liquid bass sounds. In the modern era of plug-in synths offering multiple sound sources, internal effects at the oscillator stage and all manner of other high-tech wizardry, these might seem modest controls for sound building but that's to ignore decades of Moog's work as pioneers of synthesizer design. After the oscillator section you'll find the same classic 24dB-per-octave low-pass filter which features on the Little Phatty. In combination with the biting resonance control, this will take care of your tone shaping needs and represents a huge part of the classic Moog sound. There are separate controls here to configure both keyboard control amount (opening the filter as you play higher notes) and envelope amount. But the 'game changing' function in this section is the Overload (labelled O.L.) section which effectively acts as a classic filter 'drive' control. This has the effect of super-charging the filter's response and is the single feature capable of doing most damage to your speakers and hearing! You'll love it and it's wonderful to hear the filter stage overloading yet becoming more saturated in a classic 'analogue' way - again, this is a powerful way to enhance grungy leads and bass sounds. "The Slim Phatty represents the most cost-effective way to add the Moog sound to your studio." Next door to the filter, you'll find twin envelopes which offer eight buttons. These are arranged in two banks of four and control Attack, Decay, Sustain and Release for the amplifier and filter envelopes in turn. To adjust the parameter of your choice, simply press the button you want to tweak and the rotary encoder above will show the current value via its LED position. The time we first saw the Little Phatty, we assumed that not having eight separate dial rotaries with their own real-time read-outs would provide our biggest frustration and yet we quickly got used to responding to the sound we were playing and reaching instinctively for the button we needed before tweaking to suit. With the same control set, operation is no different and this design represents a particularly sensible space compromise on a unit this size. The Modulation section features an LFO which can use a range of waveforms: triangle, square, sawtooth and ramp shapes are provided. The filter envelope, oscillator 2, Sample and Hold and Noise can also be used as modulation sources while the possible destinations for such jiggery-pokery are the filter, pitch, wave and oscillator 2. The LED around the Modulation's dial either displays LFO rate or the Amount your chosen source is routed into its destination and again, while this might sound fiddly, it works well in practice. The Master section features preset selection dials as well as the fine-tuning dial and controls to allow you to get under the hood of the Slim Phatty. Some particularly important features here include the option to activate the arpeggiator and to select whether or not this should clock internally or over USB to the tempo of your DAW. The LFO can also be clocked to tempo so if you want wobbly Dubstep basslines which throb along in triplet eighth notes, you'll be sync'd up in no time. Last but not least, this is also the area where you'll carry out tasks likes updating the firmware of the Slim Phatty. Just as this review was being written, Slim Phatty firmware update version 3.03 was announced and delivered. This actually enhances the Slim Phatty's capabilities impressively and, as the same update is not yet available for the Little Phatty (though this is due sometime next year), actually means that the desktop module can out-muscle its big brother in some important ways. Firstly, response to MIDI Control Change (CC) messages is more tightly integrated as the system at the heart of the Slim Phatty is optimised for 14-bit CCs courtesy of this update. As each dial of the Slim Phatty transmits messages via CC, this means that both send and receive messages to and from the Phatty should be smoother - a big benefit. The built-in arpeggiator also benefits, receiving its own menu to configure clock source, rate and an on/off switch to determine whether each note of an arpeggiated sequence will be sent as a separate MIDI note, among other parameters. Neat. The Slim Phatty is a little under £400 cheaper than the Little Phatty, it features the same sound engine and is currently using an operating system which actually surpasses the capabilities of its big brother in some respects. Yes, you lose the keyboard, the pitch and mod wheels and, for some, the panel might seem a little crowded now that it's been compressed down to a unit just 17-inches wide. 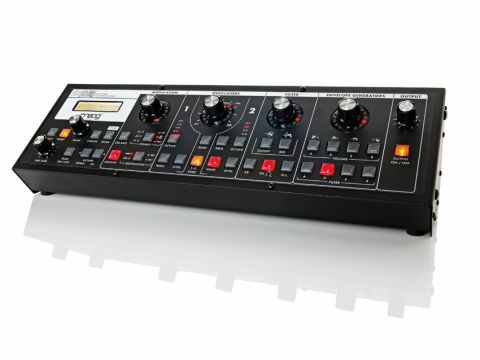 However, the Slim Phatty represents the most cost-effective way to add the Moog sound to your studio and rather than the 'Slim' in the title referring to the instrument's feature set, it refers to its size alone. It's no surprise that more and more of us lucky to have a range of 'in the box' tools are turning our attentions outwards to analogue hardware for both signal processing and sound design as analogue synths in plug-in form rarely sound like this. Don't forget that Bob Moog was instrumental (excuse the pun) in developing not only the Minimoog but in the whole concept of subtractive synthesis itself, the theory still driving many of the synths we continue to enjoy today. That pedigree and expertise oozes out of the Slim Phatty and, to reiterate, the sound is wonderful. There's now a tasty collection of contemporary synths with an analogue retro edge available, all of which are vying for your hard-earned cash. This one is a class act with years of development behind it and, if you're shopping for this kind of synthesizer, you owe it to yourself to road-test the Slim Phatty. They deserve to sell by the bucket-load.